What does it mean to be responsible? How can I be responsible? We finished the lessons for the Responsibility Unit. I am now reading individually with students and checking in on their progress. I have been impressed by how well the students are applying the reading and writing skills we have learned in their reading check-ins with me. I look forward to meeting with the groups one last time before the end of the year to do a final activity. This week the students analyzed sections of "Our Garden" by rereading and highlighting sections that demonstrated the characters acting responsibly. Then, the students put their ideas in sentences. We practiced restating the question and using details from the story to support our answers. The students again used the CUP mnemonic device to check their writing. We also learned about character traits this week. Students identified a character trait to describe the protagonist and narrator, Julian, based on details from a particular part of the story. We focused on traits that demonstrate the "inside of a character" such as feelings and thoughts. Rabbit Wishes by Linda Schute (This works well for the outside and inside traits of characters). Last week the students practiced identifying details in a story to support their answers. They read a short story called "A Better Community." Students identified important story details and the main idea of the story. Then, they drew conclusions about the lesson. Students wrote their answers and practiced writing in complete sentences. We use the CUPS mnemonic device as a strategy to remind the children about what to look for when checking over written work. The C stands for capitalization. The U stands for understanding. The P stands for punctuation. And the S stands for spelling. This week, the students read "Our Garden" from the book The Stories Julian Tells. We summarized the story by breaking it into four main parts. Then, we used textual details to support our understanding of and draw conclusions about characters. Finally, we practiced using context clues to define a vocabulary word. I encourage the students to use CUPS in their classroom writing. They could even write the letters on their paper and use it as a checklist just like Tristan did in class. Way to go Tristan! This week, the students summarized the story Flying Kites and drew conclusions about the lessons. Students used specific details from the text to support their understanding of the lesson. To be responsible means to obey your parents. To be responsible means to make good decisions when playing. This means to be safe. The students previewed and read the story Catalog Cats. The students examined the beginning, middle, and end of the story to draw conclusions about story elements (characters, setting, problem, and solution). Next week, we will summarize the story and draw conclusions about the lessons using textual details. The focus this week was on summarizing the story by thinking about the beginning, middle, and end of a book. We discussed how setting and characters usually show up in the beginning of the book. We observed how the main problem often arrives in the middle, and we learned that the main problem is usually solved in the end of a story. 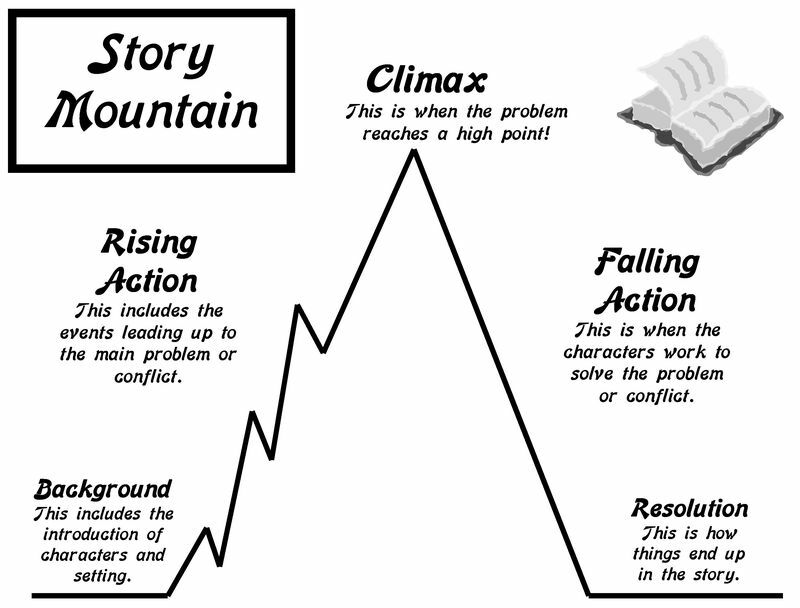 The traditional plot hill is a useful visual for showing this typical story structure. Students used the 'check for understanding' strategy to help guide them in their summaries of each section. This means that the students answered the questions who? and what? for each section. I encourage the students to practice these strategies with other fiction stories that they are reading independently. This week the students were introduced to the unit's theme which is responsibility. We brainstormed what it means to be responsible in class, at recess, and at home by completing a web. Then, the children wrote sentences from the web. Later, we read a poem aloud that offered specific examples of being responsible. The students made their own 'syllable card' (see image below) that they can use while they break apart and read longer words. I encourage students to use these cards in conjunction with 'Beats on the Body.' These strategies will not only help your child's reading progress but also his/her spelling progress. -clues from words around the word. -clues from how the word is used. I recommend any book by William Steig to practice using context clues. His books are vocabulary rich and offer many opportunities to use the clues listed above. I came across a site that has short stories related to the theme of bravery. Some stories have audio versions. Lessons are also explicitly written for each story. The link is http://freestoriesforkids.com/tales-for-kids/values-and-virtues/stories-about-bravery. Next week is the last week of classes for this first session. The students will complete a writing activity and have an opportunity to demonstrate their understanding of concepts explored during this unit. The next unit will start after the Easter break. Look for more details soon! This week the students listened to The Watcher, a picture book biography about Jane Goodall. How does she feel? What is she good at? What does she want? How does she feel? What does she look like? Who? What? Where? How? Why? -how the word is used. Encourage your child to practice these skills while reading independently and with you. This week the students read a story about a boy who visits a wishing tree. The boy, Noah, learns the lesson that true bravery can not be granted through wishes; rather it comes from within. We answered questions and practiced using evidence from the story to support our responses. The following link has offers some excellent stories related to the theme of bravery. This week the students finished reading the Native American folktale "The Girl and the Chenoo." We used a Shared Reading format, so the students could listen to proper phrasing and expression. We discussed the theme of bravery by identifying the lesson/s the author is trying to teach us about bravery. Finally, the students participated in a vocabulary activity called Which one? It is a game that helps students apply new words to a context. You choose a word and present two sentences, or a question and two sentences, to a person (see sample below). Based on the meaning of the word, one sentence is chosen over the other. It is a fun activity to play, and one round can be completed in a couple minutes. Example: The word is usually. What do you usually do before you go to bed? I usually brush my teeth. OR I usually eat candy. Which one makes more sense?